UPDATE: Despite criticism, Rep. Ilhan Omar (D-MN) doubled down on her suggestion that Sen. Graham is "compromised" on Thursday. On CNN, Ilhan Omar tries to defend tweet in which she called Lindsey Graham "compromised," saying, "I'm pretty sure there's something happening w/him...he is somehow compromised"
The CNN anchors asked her to provide evidence. “The evidence is presented to us in the way he’s behaving,” Omar said. You may have noticed that Sen. Lindsey Graham (R-SC) has had a change of heart about President Trump. During the 2016 presidential campaign, Graham was one of Trump's loudest critics. He called him out as an "opportunist" and said he was "not fit" to be president. Slowly he arrived on more friendly terms with Trump, to the point where he was one of his strongest supporters last year. His new persona even earned him a new endearment from conservatives, "Lindsey Graham 2.0." 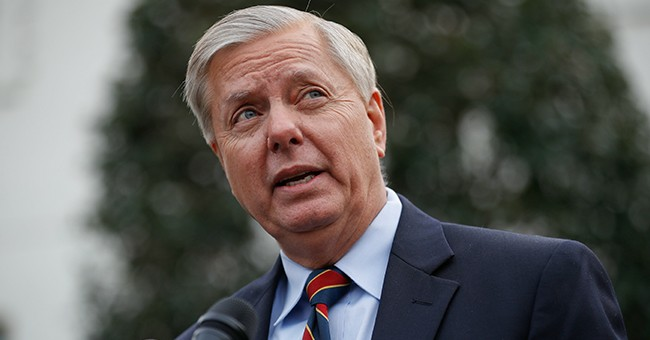 MSNBC's Stephanie Rule, however, suggested on her show this week that there's something nefarious behind Graham's new attitude. So she started to spread some gossip. Ruhle is unfortunately not the only one peddling rumors about Graham. Newly elected Rep. Ilhan Omar (D-MN) agreed with Ruhle and tweeted - again without proof - that Graham is "compromised." As even some of Omar's supporters noted, perhaps a sitting member of Congress should be legislating instead of spreading salacious rumors. It's one thing for MSNBC, it's quite another for an elected representative. Maybe there's no conspiracy. Maybe Sen. Graham's decision to support the president was a natural progression. He saw how radical the left was getting, particularly when it came to their behavior during Brett Kavanaugh's Supreme Court confirmation hearings, so his instincts kicked in and he decided to start defending our president and his agenda.